Top 5 Best Vertical Propane Smokers , propane smokers are ideal if you have a cabin in the woods that doesn't have many–or any–outlets. They're also a better option than charcoal smokers if there's a burn ban in your area. 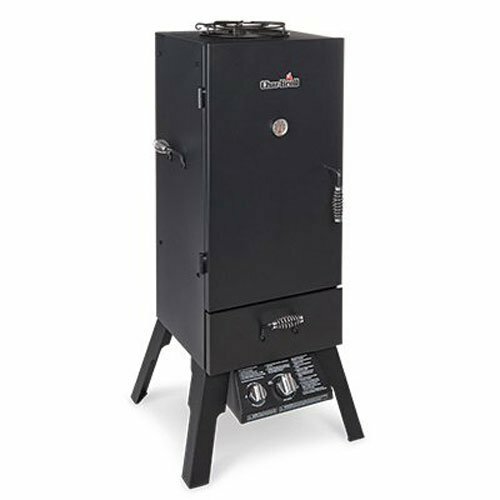 As you'd expect from a reliable brand like Masterbuilt, this smoker model gives you plenty of options. It comes in 3 sizes: 30 inch, 40 inch, and 44 inch. The more people you cook for, the larger smoker you should get. The Masterbuilt 20051311 GS30-D propane smoker has push-button ignition, which lets it start up almost immediately. It also has a porcelain-coated wood chip tray and water pan on the side. This water pan evaporates water and directs it towards the cooking meat, which keeps it from drying out. With 717 square inches of cooking space, the GS30-D has 4 chrome smoking racks that can hold lots of burgers, chicken, steaks, ribs and more. Its built-in temperature gauge is conveniently located in the middle of the door at eye level. It also has cool touch wire handles, which will keep you from burning your hands when the smoker reaches extremely high temperatures. This Dyna-Glo vertical propane smoker is another cost-effective option. You can start up its 15,000 BTU cast-iron burner right away thanks to the electronic push-button ignition. It has a large temperature control dial on the bottom, which you can access fairly easily. It also has a 784 square-inch surface that houses 4 adjustable steel wire racks that provide a secure platform for your favorite smoked foods. The wood chip box is made of porcelain enameled steel; it has handles and a lid that lets you put a variety of wood chips. 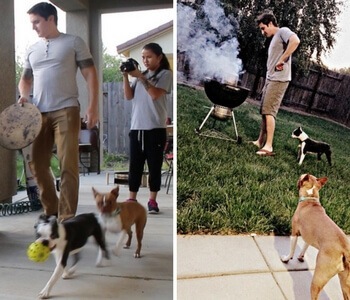 It also has a porcelain-enameled, steel water bowl that helps with the cooking process. 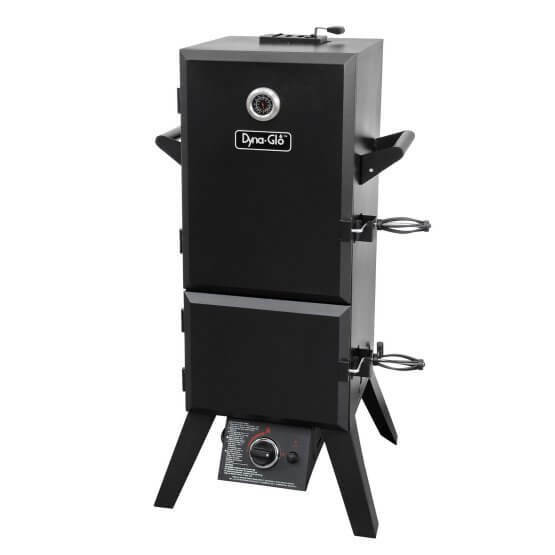 One issue with this Dyna-Glo vertical smoker is its overall durability. On the other hand, it's easy to use and store. The smoker weighs about 54 pounds in total and has one handle on each side. Almost anyone can grab it and take it wherever they’d like. The Smoke Hollow vertical propane smoker looks a lot like the Dyna-Glo model above, but it's slightly more durable. That durability comes with a price, however: This smoker costs twice as much as the Dyna-Glo does. This vertical propane smoker gives you a lot of room. It has 5 cooking grids: 2 standard cooking grids, 2 jerky grids and 1 rib rack (plus 1 sausage hanger for good measure). The smoker takes up about 6.5 cubic feet; a very large amount of space. The smoker has dual burners, which you can use separately for better control of the temperature. They're made of stainless steel, making them less likely to rust. This could allow you to smoke meat even when the weather isn't ideal. They say looks can be deceiving, and that's certainly true of this smoker. It looks sturdy enough to handle a high volume of use, but many people have found that it doesn't hold up as well as they'd like. This vertical propane smoker from Char-Broil provides the best experience for a reasonable price. It has two temperature control dials on the bottom, a porcelain wood chip, a water pan and a warming rack. These accessories will help you get that wood-smoked taste without any add-ons. Concerned about space? 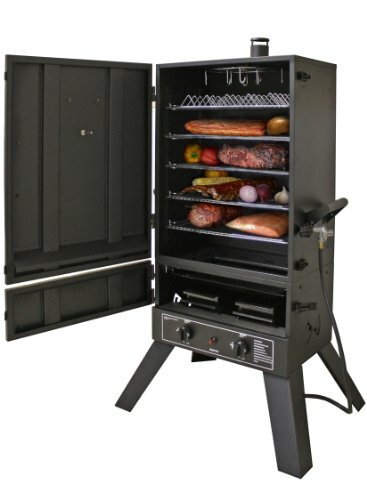 The Char-Broil vertical gas smoker only takes up about 600 square inches (about 7,500 cubic inches in all) and contains three chrome cooking grates. This model doesn't strain your budget either: You can buy one brand new for a few hundred dollars. The Cuisinart COS-244 has a narrow shape and a propane connection that can apply high amounts of gas throughout the smoker. Inside, it has 4 stainless steel, 14″ x 14″ shelves. 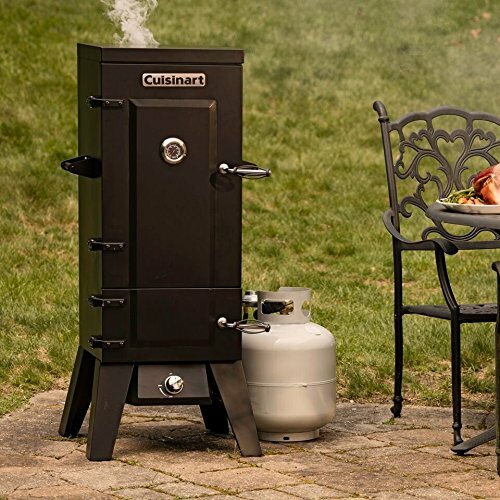 The smoker's two doors and stainless steel finish makes it easy to clean after you’re done cooking. The shape of vertical smokers can put some people off. They may feel like the unit is too narrow and doesn't have enough room for all their food. The COS-244's design seems to have these people in mind: It has a vent on the back, which adds space to the inside of the unit. It's probably no secret that smokers can get ridiculously hot. However, the COS-244 has heat resistant handles on both doors, which let you open and close the smoker without burning your hands. When you're looking for a vertical propane smoker, you should keep a two things in mind: Quality and price. First, quality. If you buy a cheaper but less effective smoker, you'll have wasted your money. Lower-quality smokers tend to leak smoke out of their doors. Since they can't contain as much heat within the unit, they won't cook as well in the winter. They'll also take longer to cook your food and make meats come out uneven. All 5 vertical propane smokers on the list above have one large door on top and a slimmer door on the bottom. These let you check the flame without losing heat or smoke. As long as the doors seal tightly, they should help maintain the smoker. Now let’s think about price. Most of the smokers on this list have low prices without compromising on quality. 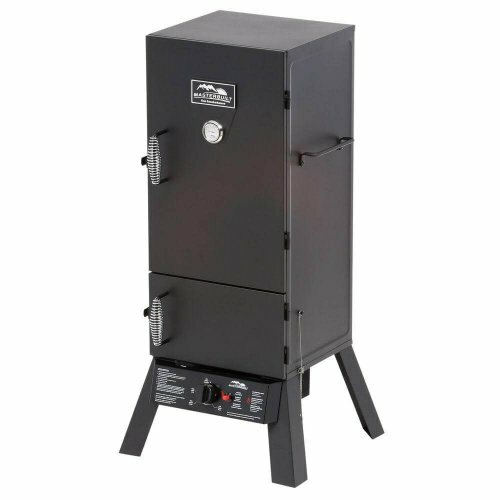 The Masterbuilt smoker, for example, provides a great balance of quality and value. If you can afford something more expensive, the Smoke Hollow unit gives you better durability. It can hold any type of food and keep the heat inside regardless of the weather. You'll also have to pay for a propane tank to fuel the unit, though. You might also need to pay for an adapter, depending on the size of the tank. The biggest benefit of using a vertical propane smoker is its speed. They require much less attention than charcoal- and pellet-fueled smokers do. Typically, they also take up less space than traditional horizontal smokers do. Propane smokers take less time to fire up than other units do. Many of them have a quick-start ignition and a hose that can connect them to propane tanks of different sizes. Since they're powered by propane tanks, these vertical smokers are fairly portable. Some of these units have carrying handles, making them easier to take on your next camping trip or picnic. Smokers can be pretty heavy, however, which might prevent some people from moving them easily. Another advantage of vertical propane smokers are their relative affordability. You can purchase many of the smokers on this list for less than $200. You may need to pay more for longer-lasting units, but the quality you get for your food will be worth it. Cooking with propane has a couple of benefits. It burns clean, which means that you won't need to worry about residue contaminating your food. It's easy to use and doesn't require much attention. You can just “set it and forget it,” as the saying goes. Admittedly, even some of the best models have drawbacks. However, vertical propane smokers don't have too many major negatives overall. The biggest one is probably the propane tank, which you'll need to refill eventually. It's a good idea to make sure you'll have enough propane before you start cooking. Also, cheaper vertical smokers tend to have lower-quality metal. This gives them less durability and makes for more uneven cooking. While cooking with propane is faster than cooking with wood, it won't give you that wood-smoked taste. However, you can get wood chips and various accessories to compensate. If you want to cook quicker and enjoy the outdoors, a vertical propane cooker may be just the ticket. They're decently priced, they start up quickly and they don't take up too much space. Use the info here to determine which smoker is the best for you.